Celebrating the art of crochet and all it's creativity. Showcasing my crochet designs and patterns that are featured at Cute Crochet. Hoorah for the Red, White and Blue! We have released a new pattern in our Cute Crochet Shop. When I design, I love combining other craft elements, like fabric, to my crochet designs. 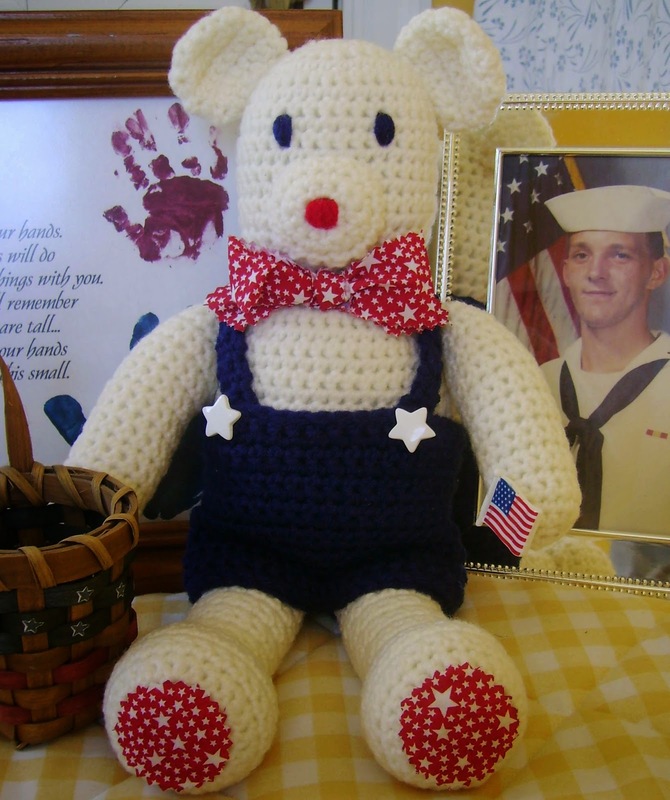 The red and white star fabric is perfect to dress up our Fourth of July Bear! Our new LIBEARTY measures 9″ Tall Sitting; 13-1/2″ Standing and is fast and fun to make! The pattern uses #4 medium worsted weight yarn. Our introductory price for our new listing is 50% off until July 31, 2014. Click HERE to purchase him and enter the coupon code JULY5 after you add him to the cart. And don’t forget! Our I Love America Doll is also 50% off until July 31st with the same coupon code! That is two for the price of one! It is time for Monday Market again! Monday Market is being offered to the readers of our blog and Facebook fan page and will showcase one design for a week from my Etsy shop at Too Cute Crochet by offering the crochet pattern at a 40% discount! One of our newest patterns is the Animal Flap Purses and is the one we chose for this week’s Monday Market! 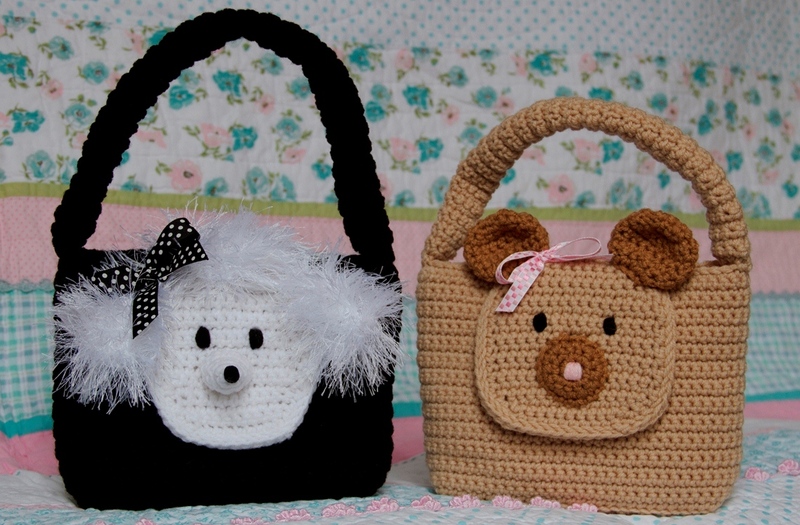 For this week only, you can purchase the Poodle and Bear Flap Purses pattern for $3.60. That is 40% off the regular purchase price! Two patterns are included with this set. Sale runs through FRIDAY February 3rd. Happy New Year! Pop on over to our blog, Cute Crochet Chat to view a new feature from Too Cute Crochet! With Monday Market, you can save 40% off a crochet pattern of the week! 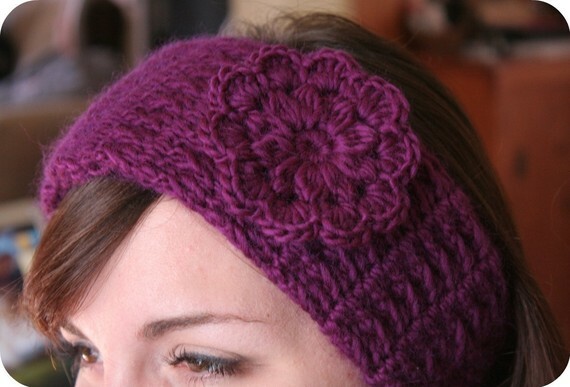 Our first pattern offered is the Pretty Headband with Flower! Happy New Year everyone! At Cute Crochet Chat and Too Cute Crochet we are celebrating the new year by adding a new feature to our blog. I call it Monday Market and it is being offered to the readers of our blog and fans of our Facebook page! . Monday Market will showcase one design a week from my Etsy shop at Too Cute Crochet by offering the crochet pattern of the week at a 40% discount! Our best selling pattern is the Pretty Headband with Flower, so it is the first pattern that we offer for SALE in this new feature for 2012! For this week only, you can purchase the Pretty Headband with Flower for $2.40. That is 40% off the regular purchase price! Sale runs through FRIDAY Janurary 13th. Stay tuned each week for a new Monday Market! Summer Clearance SALE on Yarn, Fabric and Kits!